Home canning basics are packing of fruits, vegetables, meat and other foods into glass jars and heating the jars to kill active bacteria present in it and also to prevent it from spoilage. Home canning is also a popular way of preserving fruits and vegetables to soups and stews. Water bath canning and pressure canning are the two types of method in home canning basics. Water bath canning is ideal for high acid foods like tomatoes and strawberries while pressure canning is ideal for low acid foods like meat and vegetables. In home canning this methods are very important for they prevent the growth of harmful micro organisms present in our food. Improper home canning of food will result in botulism and food poisoning that will risk people of high risk of illnesses or even death. Home canning starts with what types of utensils you will use that are basically seen in your own kitchen such as measuring cups and spoons, rubber spatula, timers, peelers, pots, saucepans and mixing bowls. The equipment to be used depends on what canning method you are going to perform. 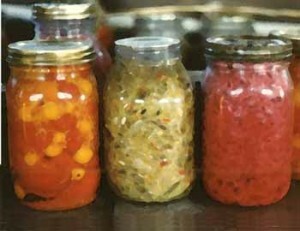 The specific tools for canning are lid wand, wide mouth funnel, lid and bands, wide mouthed mason jars and jar lifters. All tools, utensils and equipment should be clean, dried and sterilized for safety and for the success of making your preserves. Knowing the right canning you will perform depends on what food you will can or preserve. In doing this method, you should know all its basics first. Cooling and checking your canned or preserved product is important. Storing your canned and preserved food in a cool, dark and dry place will help in preserving vitamins and minerals in your food. In home canning basics, there are do’s and don’t, never ever use overripe fruits, always choose the best top quality ingredients. Don’t ever add more low acid ingredients than the required amount in the recipe, adding also of seasoning and spices is a big no. Choosing the best thickeners also is a plus. Never place jars in ovens like electric ovens. Maintaining boiling and pressure temperatures must be always checked. In preventing discoloration in fruits it’s okay to put some commercial acids. Use jars that don’t easily break, never use mayonnaise jars for they break easily when heated. Use only required jars, mason jars. Removing air bubbles and leaving the right amount of space is also a factor in home canning. Home canning basics are easy to follow and understand. Knowing these facts will help you preserve your favourite foods safely for a long period of time thus you can enjoy the flavour of homemade food anytime and anywhere.